Dr. Seuss is a literary rock star to children. 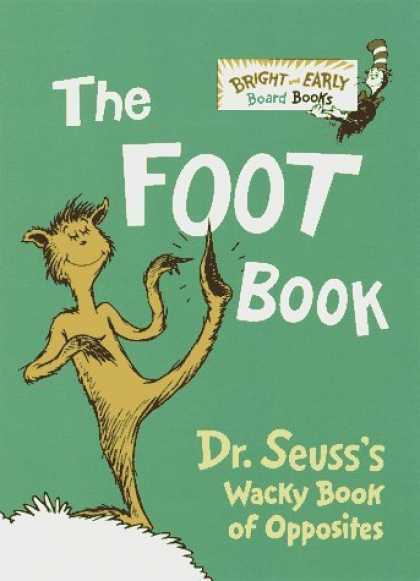 There’s so many to remember, however this last week got me thinking of “The Foot Book”. Okay, for those of you with podophobia (fear of feet), you probably wouldn’t like it. But the feet fetish folks are now salivating…take it easy! But seriously, we can determine whether we meet many or few feet, small feet, big feet, or even pig feet (oink, oink). It’s a matter of putting ourselves out there and embracing the unexpected. Right feet, left feet, meet feet, TWEET feet! This book came to mind after all of the many, many feet, er, tweeps I met this past week. I’ve been in Chicago for just three months now and this is the first week I’ve felt the floodgates really open wide. It started with my friend @catherineellen, whom I met at a @SMCChicago event back in January. She invited me to this Tweetup for those who were #notatsxsw. And at this event, I met more fantastic people than I could have imagined. And they are all local to Chicago. So instead of simply conversing via Twitter, I’ll actually get to meet and hang out with these people IRL (in real life..took me awhile to get that at first). However, getting to meet those who don’t live in or near Chicago is also rewarding – my meeting @elliebpr is proof of this (check out her blog post). After spending one evening with @catherinellen, @SamiAri, @chanthana, @manamica, @FeliciaCago, @Spiewak, @stephdem, @stacyjill,@mattchevy and SO many more, it reminds me that we can never predict the “many, many feet we’ll meet”. So I’ve done some exploring and continue to look for the best free social media monitoring tools. Here are the ones I am currently using. Anyone have suggestions of other free tools? What works for you? Twazzup – http://www.twazzup.com/ – great search tool for Twitter! Let me know if there are other tools you use that are particularly helpful! We are all aware that Americans runs on Dunkin’. But this American institution is doing great things with social media. 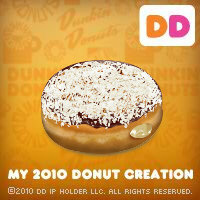 It’s Dunkin’s 60th Birthday and they are in the midst of their second “Create Dunkin’s Next Donut” Contest. The contest basically allows anyone and everyone (13 and up) to create the next donut that will be distributed — with their own flavor combination, look, and name. I’ve posted the “teaser” ad that has tried to get people intrigued and excited about the contest. This 60 second ad was greated by Stuidocom in Boston, which has a rockstar list of clients such as CVS, Dunkin’ Donuts, Microsoft, Philips, Sony, tbs, and Coca Cola…among others. They also helped DD launch the MyIcedCoffee.com campaign, in partnership with MapQuest, to “effectively engage with youth” and allow travelers to plan their road trips and map out where DDs are located. I’m excited to see more of what Dunkin will have in store as far as interacting with consumers. And of course, I have to share with you the Donut I created: I call it the Coco Peanut Butter Crunch. It is a donut with a round shell, filled with peanut butter kreme, topped with chocolate icing, chopped peanuts, and coconut. And a donut is not a donut without a description: Peanut butter and chocolate are a classic combination and a taste unique to America. The coconut on top inspired by an Almond Joy, except this donut is topped with crunch peanuts instead of almonds. This is as genuine and bold as Dunkin Donuts is to the American experience.